Form meets functionality at Lenchner Glass. Imagine your interior design enriched by the vibrant colors of fused glass, and enhanced even more by state-of-the-art lighting. Our architectural installations offer a stunning departure from the mundane granite or ceramic tile. 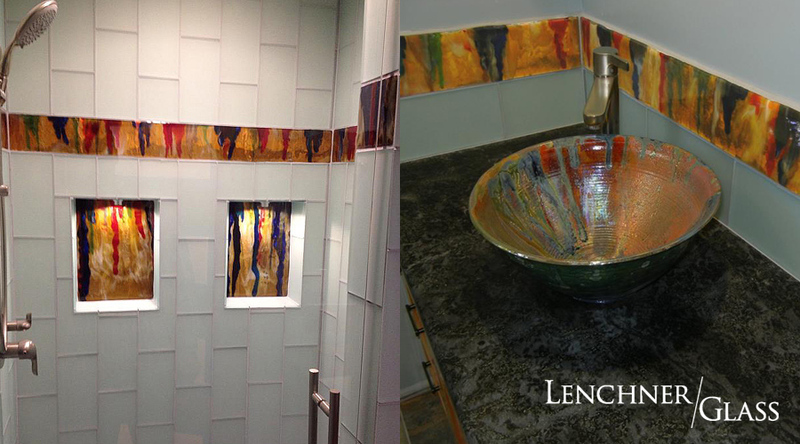 Bring Art into your every day life with Lenchner Glass fused glass counter tops and back splashes. We incorporate a wide variety of iridized streaky opal glass under crystal clear glass, up to 1″ thick, to bring you safe, durable, and easy-to-clean counter top surfaces. Dimmable fiber optic lighting adds a new layer of dimension to your custom design, with nothing electrical at the surface of the counter. Take it a step further and develop a uniquely themed environment. 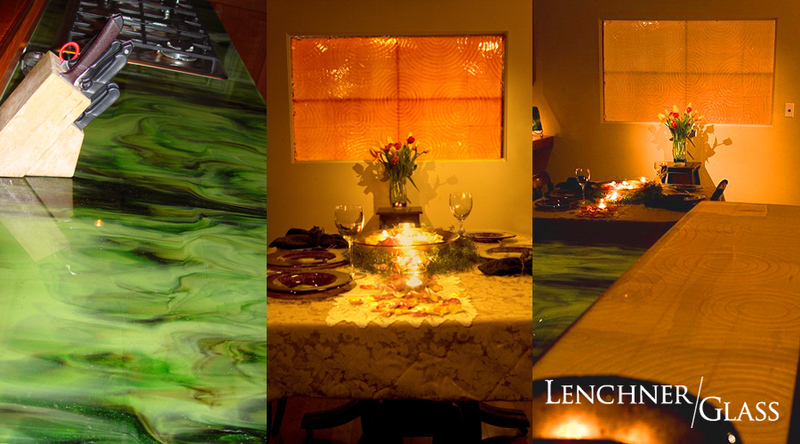 Lenchner Glass can create tableware to match your architectural installation. The possibilities are endless with Lenchner Glass. Have your interior designer call (818) 609-9406 for a tour of our studio to find out more about our imaginative custom designs in fused glass. 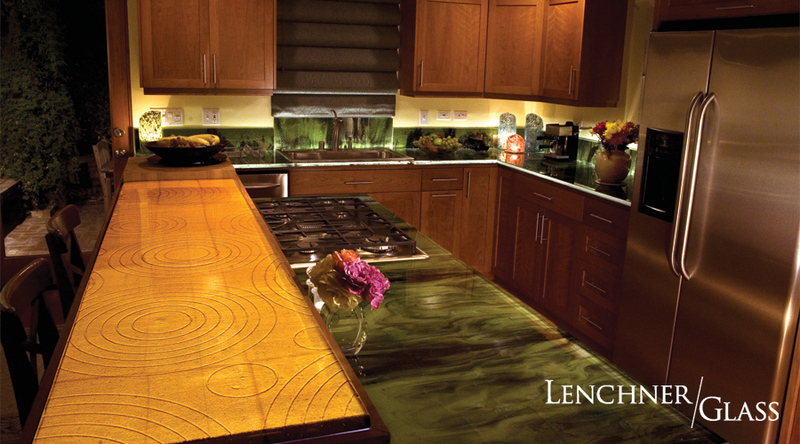 Custom glass countertops and backsplashes made to any color or motif, including designs custom to your desire. Matching tableware can also be created to compliment your custom countertops. State-of-the-art fiber optic and flat panel lighting options available to make your counters and backsplashes unlike any other! The concept for this complete bathroom remodel started with the homeowner’s selection for the sink basin. From there, Lenchner Glass replicated the flower dragon motif design in tiles for the sink backstop and tub areas. Dual images for foreground and background were machined using a water jet, and then frit painted for an authentic hand-painted effect. This versatile technique can be applied to create custom-designed fused glass table tops, room dividers or countertops for your home, office, hotel or restaurant. The inspiration for this remodel is based on the sink design selected by the homeowners. Lenchner Glass replicated the look by creating more than 300 hand-cut “drips” from sheet glass, iridized glass and dichroic sheet glass. These were assembled and fused down to approximately 26′ lineal feet of fused glass tile. Selections were then measured and cut for the final shower and sink-top installation theme. This wall installation gives the room a unique ambience, with concentric circles fused into the back and front of the glass. This theme is carried through from the kitchen countertops and tableware, as a unique recurring motif. If you’re interested in a one-of-a-kind look for your next interior design, contact Lenchner Glass to explore the possibilities our fused glass designs have to offer. This mural was created by fusing eight layers of glass together. Angel fish, clown fish and seahorses were individually cut and placed between the layers to create depth. Additional texture is added with frit painting, and the piece is lit from behind with low voltage flat panel lighting.